One of the most useful herbs - a key ingredient for many Italian and Indian dishes and great when fresh in salads. The 'fresh-from-the-garden' taste is far tastier than the dried variety - it is almost impossible to buy fresh basil in the UK. Basil originates from India where it is considered sacred to the Gods. It now grows wild in the Mediterranean areas, and is one of the most popular herbs in that area. Basil lives up to it's origins and is best suited to the warmer areas of the UK although with correct positioning, it will thrive as a container plant in most cooler areas. As sunny a position as possible with well-drained soil. Basil has one key requirement - sunshine! Position it in a protected full-sun position in warmer parts of the UK, and if this is not possible, grow in a moveable container. Soil should be well-dug and well-drained. If the soil is heavy, add sharp sand and multipurpose compost to help drainage. In April, sow three seeds to a small pot in normal moist potting compost. Lightly cover with compost and place in a warm (15C or 60F) dark position - try and keep the temperature as constant as possible, never letting it drop below 10C (48F). The seedlings will emerge in two weeks time and the plant should be placed in a sunny warm position. Basil hates water on it's leaves and stem, so water from below. Other than sun, basil has few requirements and can be planted outside as soon as the temperature reaches 10�C or more mid-May time normally. Note that basil is killed by any degree of frost and can even be killed when cool temperatures last for a significant period. So if your area is not in a warm part of the UK then grow in a container and be prepared to move the container indoors if there is any threat of frost. 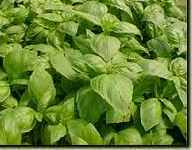 There are many varieties of basil, the readily available ones are described below. Cinnamon Basil (Ocimum basilcum) - form Mexico, with a cinnamon flavour. It grows to a height of 45cm (18in). Lemon Basil (Ocimum citriodorum) - mild lemon flavour, commonly used with fish. It grows to a height of 30cm (12in). Red Rubin Basil (Ocimum basilcum) - similar to sweet basil but very darkly coloured leaves. Thai Basil (Ocimum sp.) - very spicy, used in Indian cooking. It grows to a height of 90cm (3ft). Pinch or cut the leaves off as required, but always from the top. When the plants begin to produce flowers, pinch those out as soon as possible to encourage more leafy growth. Fresh basil is by far the best for flavour. However, it can be dried by tying the leafy stems into bunches and hanging them upside down in a dry, warm and dark place until dry. Then crumble the leaves into small particles and store in an airtight jar. Basil will retain almost all it's flavour if placed in small plastic bags and put in the freezer. A more traditional method of preserving all the flavour of basil is to layer the leaves in a jar, and lightly salt them. Cover the leaves with a layer of olive oil. Seal the lid tightly and place in a cool, dark spot or refrigerate. Use the leaves as needed and reseal each time. This will keep up to six months. The oil soon becomes infused with the essence of the basil, making it ideal for use in dressings or in pastas. Basil is ideally suited to container growing in normal potting compost. Water regularly (from the base if possible) and feed twice a month with liquid plant food. As the season progresses, move them round the garden to the sunniest and most protected position. Basil will grow well indoors on a sunny windowsill. 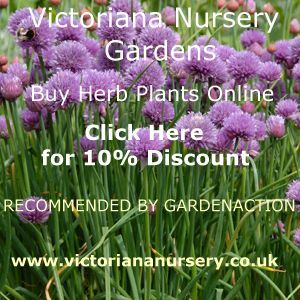 See our in depth pages on growing herbs in containers by clicking here. Message: I am growing a few herbs in potted containers due to southern california has snails/slugs that wreck havoc on herbs. Currently I have a 2 different rosemarys, cilantro, Parsley, Sage, Chives, Thyme, Oregano and basil. All of these do very well but I don't seem achieve the best basil as I have seen others achieve VERY large leaves and extremely bushy plants. I have grown basil a few times in the past with average results. With the new tips I have learned and utilizing on my newest batch that I just started 4 days ago, here is what I'm doing. Anything I'm missing, please let me know. I generously moistened the soil then transplanted my basil which was store bought and already 4in tall. I watered the basil at the base of the plant as I read somewhere to avoid excess water contact to the leaves. I also purchased some Fish fertilizer(emulsion) and mixed accordingly. 1TBSP per gallon of water into a spray bottle. Generously spray basil every 2 or 3 weeks. I live in San Diego where rain is rare. The pot gets a good 7hrs of good sunlight with temps in the low to mid 80s currently. Are there any other tips or tricks that I am forgetting? is the fish emulsion spray adequate enough or do you recommend more feeding? If so, what product and how often? Thanx for reading and any info will be greatly appreciated!! I have around 12 containers that I have planted sweet basil. It is placed and kept in full sun with 32 degrees celcius. They are getting healthy.Two questions. when can i use the leaves they are 45 days old.Another question how can i use them in food? Message: I'm wanting to sell our fresh basil, but not sure how to keep it fresh for the customers. Is there a way to use plastic containers and still keep it fresh? Message: Good day! I Have great success growing herbs, especially Basil. Rich soil(compost mixed in), full sun(at least six hours direct sunlight per day) and plenty of water( every day in pots, every second or third day if planted in garden). It's also a good idea to give it some manure(feed) the plants after the first month of growth. Good luck! Enjoy life! Message: YOu need to talk about Tahi basiel more because that is what i typed in for a search and then this came up and it dose not tell me anything about the baisel and how to take car of it. Message: You can purchase said 'Basil' at every Tesco in the UK.